This card will appeal to those looking for a low rate card and to those who occasionally carry a balance. Unlike other cards, you are also kept up to date on everything about the card from voting on new card design to annual financial statements. 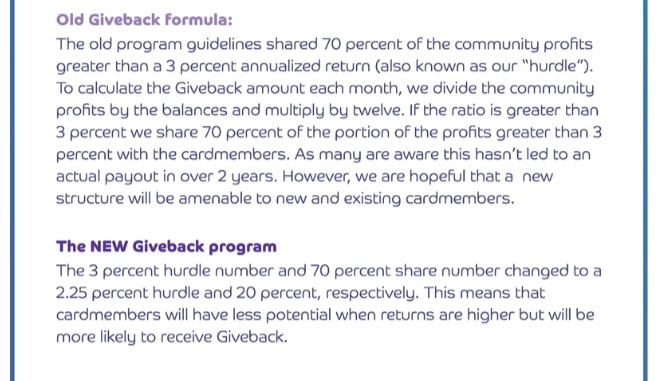 Though it has no "official reward program", the card has something called the Giveback program. Here is how it works. Card members have access to information like how is the card doing (and how are Barclaycard cards doing). This includes information like growth in spending per card, new sign ups increase etc. There will be suggestion on how to distribute "profits" to card members (which you can vote on). The original formula called for 70 percent of the communities profits greater than 3% annualized returns (also known as their hurdle rate) was paid out. However, due to the economics, there wasn't any payout with this formula. 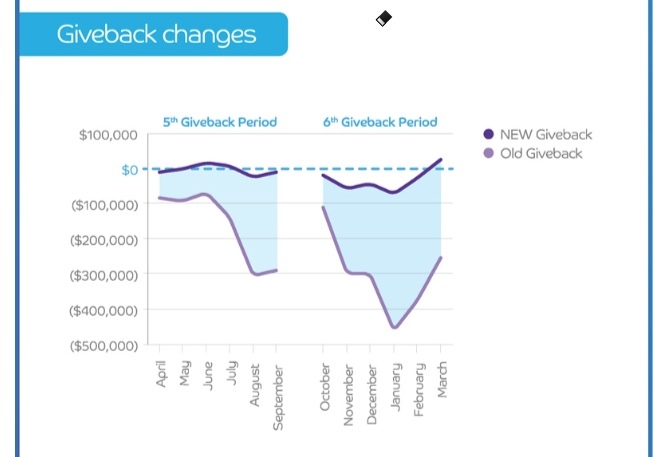 In 2014 and 2015, Barclaycard and the community decided to changed the formula. Under the new formula, the hurdle is reduced to 2.25% and 70% of the community profits was reduced to 20%. Barclaycard expects to have payouts under the new formula. What Have Members Voted On So Far? - Given that the card members can actually vote on new features, one of the questions you might be asking is what new features has the card acquired since it's launch? Well, here are a couple of examples. 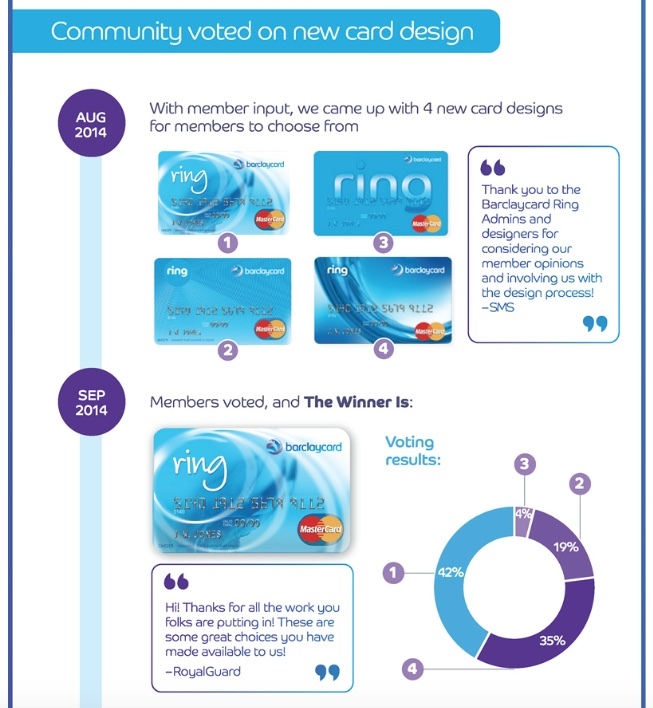 New Card Design - With Ring members input, four new card designs were proposed in August 2014. By September 2014, a winner was chosen. 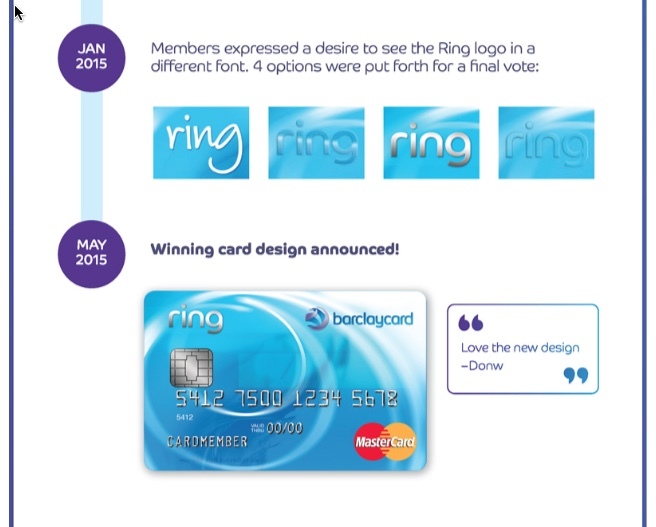 In January 2015, ring members wanted to see variations of the "Ring" font and style to be put on a new card and they were given four designs. In May 2015, they had chosen their font together with the card design. 5/15/2013 - Late Fees - On May 15th, members voted on a new late fee structure1. Here is how works now. Each card holder will have one late fee waived once every 12 months. But they will be charged a late fee of up to $26 (the amount of the fee varies by state) and do away with the three extra payment dates. 12/12/2012 - $10,000 Donation - Card members voted to donate $10,000 to Ronald MacDonalds' House of Delaware2. Community Discussions - One of the attractions of this card is it's social component and the ability to discuss and vote on issues. The Barclaycard Ring Card maintains a blog where interesting topics are discussed. One of the topics that interest me was the discussion of rewards3. As you could figure by now, this card really does not have any rewards. But many card members would like it to have one. But Barclaycard explained why this is difficult. Essentially, reward programs are costly to run and most will have to make it up by charging a higher APR. In fact, the average rate for rewards card is about 14% to 15%. To run a card with a 8.25% APR and no annual fee, it is almost impossible to have a reward program. There have also been community discussions about having variations to the interest rate in exchange for rewards. For example, ideas given included having a 14% APR but having the ability to earn 1.5% cash back. Rather than answering this question directly, we have to first take stock of what sort of card is this. In terms of features, I would classify this card as one which has low interest rate and a very simple, transparent fee structure. The APR is a flat 8.25% for everything. There is no annual fee and no over-the-limit fee and even no balance transfer fees. There are really no rewards. But this card would not have any applicants and members if the only features are a low interest rate (since many cards have low interest rates). Instead, this card tries to be (and probably is successful) different from others by involving it's members in the status of how the card is doing and more importantly, to introduce new features that the community wants. There are already more than 100 ideas and suggestions and a couple of them (mentioned above) have been implemented. In this sense, it is truly unique in the marketplace and no other card involves it's members in implementation of new features or even modification of existing policies. Barclaycard is counting on the fact that members want to be part of the decision making process rather than just being a consumer. If you are looking for a low rate card, and/or if you like what Barclaycard is doing and want to have a say in how your card evolves, then you should definitely consider this card.